"Opposites Not Only Attract but Light Fool's Gold Afire!" How was Shane Stryker supposed to know that the red hot redhead dancing on the bar was actually Annabelle Weiss the librarian who at the moment was showing her friends how to do the happy virgin dance of the Maa-zib women who were the focus of a fundraising bookmobile benefit that was currently driving Annabelle to extremes. What he also didn't know was that Jo's Bar was a women's bar with shopping network on the television -- not football -- wrong clientele. So much for adjusting to Fool's Gold. But the fun hasn't yet begun -- Shane has volunteered to teach the librarian, his future sister-in-law's best friend, how to ride a horse, never for a moment guessing it was his redhead. Life sure throws curve balls. It was all Shane's fault after all who ever told him librarians were mousy cardigan wearing women. And just being near Annabelle was turning him into a blubbering idiot. It could only go up from here. For Annabelle she was going to have to toughen up on many levels. First learning how to ride a horse no small feat for a very petite woman but that was going to be the least of her trials -- trying to figure out this super handsome rancher who took turns making her tingle and at other times seemed to be laughing at her expense. She was looking for a man who thought she walked on water and ignored any flaws -- like her friend Heidi had found with her husband to be. Annabelle has a choice -- toughen up and stop being some man's doormat and put her heart back out on the market, something she honestly worried about. But the more time spent with Shane and his temperamental horses the more she gains self confidence and the guts to make a move. Shane was looking to settle down in Fool's Gold but even though immensely attracted to Annabelle was constantly on guard watching her demeanor around other men. Once burned twice shy, both Annabelle and Shane had trust issues to conquer. But love does conquer all. Could it be love or just lust? No one sets you up for a good laugh better than Susan Mallery -- that's why her books are a joy to read and keepers. Uplifting and sensuous with just the right amount of personal drama and angst, page after page an all around good read -- as usual. 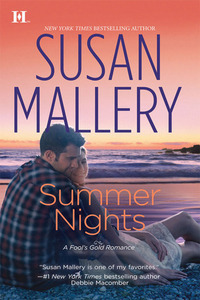 SUMMER NIGHTS is the second of three stories for 2012 set in wonderful Fool's Gold and once again we get to spend time with its citizens who with each book become more noteworthy. Meeting the Stryker brothers is a real treat and I can't wait to see who the next installment is about. Small-town librarian Annabelle Weiss has always seen herself as more of a sweetheart than a siren, so she can't understand why Shane keeps pushing her away. Shane has formed the totally wrong impression of her but only he can help her with a special event for the next Fool's Gold festival. And maybe while he's at it, she can convince him to teach her a few things about kissing on hot summer nights, too-some lessons, a girl shouldn't learn from reading a book! Re: Opposites Not Only Attract but Light Fool's Gold Afire! Summer Nights was such a great book. I absolutely loved Annabelle and Shane's story!